Garbanzo beans in a large sprouting jar. With a good glass sprouting jar, making your own sprouts is fun, nutritious and quite convenient. In the past I’ve had mixed results with garbanzo beans. The first time I tried to sprout them, I got beautiful little sprouts after 3 days but the next two times, I couldn’t get them to sprout at all. Perhaps the seeds weren’t raw to begin with or were not of good quality. They just seemed to “rot” before they would sprout. I asked my daughter, Linda, what her experience was with sprouting garbanzos and she gave me her secret. She sprouts them in the refrigerator! Since my house is generally cooler than hers, I kept the sprouting jar in the refrigerator during the heat of the day and took it out at night. As you can see, it worked beautifully. I wouldn’t do this with most other sprouts as they generally require a more steady environment of about 70 degrees. For nutritional information on garbanzo beans, see my July 13th and August 14th posts . Flax seed oil is added to balance out the high omega 6 content of the tahini, garbanzos and olive oil giving it an optimal 4:1 ratio. 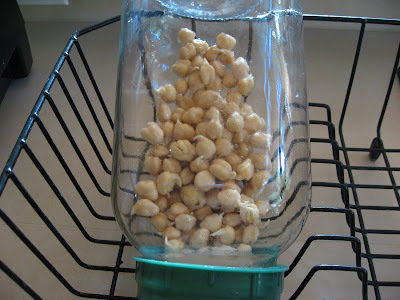 Four days in advance, place the dry garbanzo beans in a large sprouting jar. Cover with cool, filtered water (about three times their volume) and gently swirl the jar to remove air pockets. Soak for 12 hours. With the sprouting lid on, drain the water, rinse, and drain again. Place the jar upside down and store out of the sun. Rinse and drain every 8 to 10 hours and keep jar inverted. To prevent rotting, you may store the inverted jar in the refrigerator during the day and leave out of the refrigerator at night. In about 3 days, you will see a little "tail" about 1/4 inch long. Rinse well. They are now ready to use. You should have about 1 1/2 cups of sprouted garbanzo beans. Place the sprouted garbanzo beans, tahini, zucchini, garlic, lemon juice, salt, cayenne pepper, flaxseed oil and 2 teaspoons of the olive oil in a high speed blender or food processor. Blend until smooth, occasionally scraping down the sides. Put the mixture in a serving bowl and stir in the parsley. Taste for salt and cayenne pepper and adjust if needed. Drizzle with the remaining 1 teaspoon of olive oil, garnish with another pinch of chopped parsley and serve with raw vegetables or crackers (see my raw cracker recipe). Per serving: 182.1 calories, 9.7 g fat, 1.2 g saturated fat, 0 g cholesterol, 6.9 g protein, 19.0 g carbohydrates, 5.1 g fiber, 0.7 g omega 3 and 2.7 g omega 6 fatty acid. I sprout all sorts of beans - moong (green gram), garbanzo, dried peas, black-eyed peas etc. I soak the beans for at least 24 hours, rinsing and changing the water once or twice. I then line a colander with a thin piece of cloth (2-3 layers of cheesecloth will work) and drain the beans into it. Then I bundle the cloth and leave it in an open pot. Some beans will sprout real quick (black-eyed, moong) while others may take a day or two. And I forgot to mention - I sprout a large quantity enough for 2 meals at least. I use half and throw the rest in a ziploc bag into the freezer. This way, when I'm in a hurry, I have pre-sprouted beans ready to cook. I can understand sprouting to use the sprouts (like alfalfa or something) but in a case like this, whats the point of sprouting the beans? Does it soften them, or increase the availability of the nutrients or something? When a bean or seed germinates, it is said that its nutritional content increases significantly, although I haven't seen a lot of data to demonstrate the actual amount. It also makes the bean more digestible and reduces its phytic acid content. Phytic acid inhibits the absorption of minerals like calcium, iron and zinc. (Soaking, rinsing and cooking will also reduce phytic acid and make the beans more digestible). Uncooked sprouts, however, will still have their live enzymes intact, where the cooked beans will not. I have read that the protein content of beans increases by as much as a third when sprouted. Thanks for the answer. I do love sprouts, just wasnt sure what made them so good! Sorry you disliked the flavor. It shouldn't have tasted bitter but perhaps it was your tahini (which sometimes can be very bitter) or just, as you say, your palate. Luckily you can make this with cooked or canned garbanzo beans. Can you make this with sprouted black chick peas? Thanks for a great recipe and clear instructions. How can I extend the shelf life of hummus in the refrigerator?, Are there any health supplements preservatives in order to solve this issue? How long are you trying to extend the shelf life? Maybe a touch of citric acid would help. I use that in canning. How long does the raw hummus stay fresh for if kept in the fridge please?